"One Woman's War will undoubtedly earn a place as one of the most valuable personal documents of the Second World War." - Montreal Gazette "A compelling memoir." - William French, Globe and Mail "The eyewitness report is so vivid, so utterly human, that one puts down the book with the feeling of having been there. Unfortunately, due to sales rights restrictions, we cannot offer One Woman's War for sale in your country. This is a story not of military campaigns and grand strategy, but the joys and sorrows of life on a more intimate battlefield – the battlefield of the French resistance. Born and raised in Saskatchewan, Gladys Arnold was sent to Paris by Canadian Press in October 1939, and was the only Canadian reporter to experience the invasion of France by the Germans in the spring of 1940. One Woman's War is Gladys Arnold's vivid eyewitness account of the fall of France and the growth of the Free French resistance. She was one of the first journalists to interview General Charles de Gaulle, and she brings to life many of the memorable people, French and Canadian, who fought the underground war. One Woman's War is an account of some of the most important and harrowing events of the 20th century, told by a marvellously engaging and courageous woman. 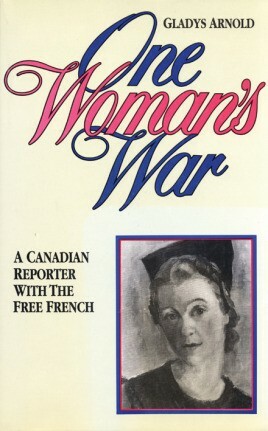 Gladys Arnold was Paris correspondent for Canadian Press from 1936 to 1941 and information officer with the Free French in Canada from 1941 to 1947.